Twenty-four-year-old Barry Munro pulled off his shirt and dove into the blue lake in northern Ontario. It was a perfect dive, one he had performed dozens of times. But the summer of 1987 had been a dry one, making water levels several inches lower than usual. Barry's head struck a rock that had been obscured below the water's surface. Without the many friends around who pulled him out to safety, Barry is sure he would have drowned. Adoctor toldBarry he would never walk again, and Barry sat dumbstruck in his bed, scarcely believing the news. He later relayed the conversation with his nurseand saidhe didn't believe the doctor's words. The nurse surprised him by saying, "Okay. What do you need to do?" This nurse, without realizing it, set a path for Barry's future that involved a lifelong dedication to spinal cord research. In the decades since, he's become an advocate pushing for increased consumer focus on and participation in neurotrauma research. He was twice awarded the Queen's Jubilee Award for outstanding citizenship and serves as the Chief Development Officer at the Canadian Spinal Research Organization. It seemed only fitting that Barry should also be the recipient of the Ralph W. Braun Spirit of Ability Award, an award given to people who work for the betterment of the disability community. A licensed personal injury lawyer by trade, Barry is no stranger to advocacy. He calls the accident part of his "destiny" and says it helped him understand why he was put on Earth. Now his work has the ability to affect everyone, and he makes it clear he won't rest until he and others can walk again. "It's sort of a selfish motive," he says without remorse. "I do want to walk again. But I also believe it's my moral obligation to give back to the next generation. My kids and [anyone's kids] shouldn't have to go through what I've gone through in this day and age." Barry accepted the Spirit of Ability Award on behalf of the thousands of peoplewho share his passion to find a cure for paralysis. 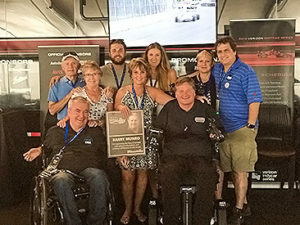 Hewas fittingly presented the honor by Sam Schmidt, a fellow quadriplegic who has his own foundation, Conquer Paralysis Now, with the same mission. With these two men leading the charge to find a way to walk again,paralysis doesn't stand a chance.